Your portrait images deserve to be printed and enjoyed for a lifetime. We offer a beautiful line of custom products to accompany your family session. With wall art choices to suit every need and budget, hardbound, lay flat photo albums with linen or leather covers, custom image boxes, and many other products, there is truly something for everyone. Contact me today to setup a complimentary consultation to see these for yourself. I can't wait to show you my favorites in person! Albums are perfect for the clients who can't leave any of their favorite images on the table. Our lay flat albums can be customized with linen or leather cover materials. All albums include thick, luster-coated pages that repel fingerprints and damage. 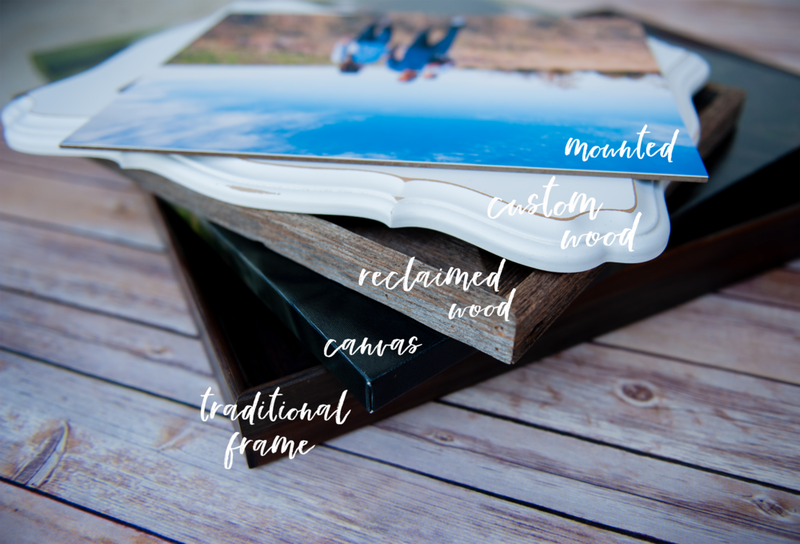 These customizable wood frames come in several sizes and colors in order to best match your style and the location in your home where you'd like to hang each beautiful frame. Our favorite styles are the "Audrey" frame (shown here) and the "Johnny," a beautiful round frame. You have to see these beautiful canvases in person to truly understand the work of (he)art that goes into creating this type of wall art. All canvases include sawtooth or wire hangers, allowing them to be hung immediately so they can be enjoyed right away! 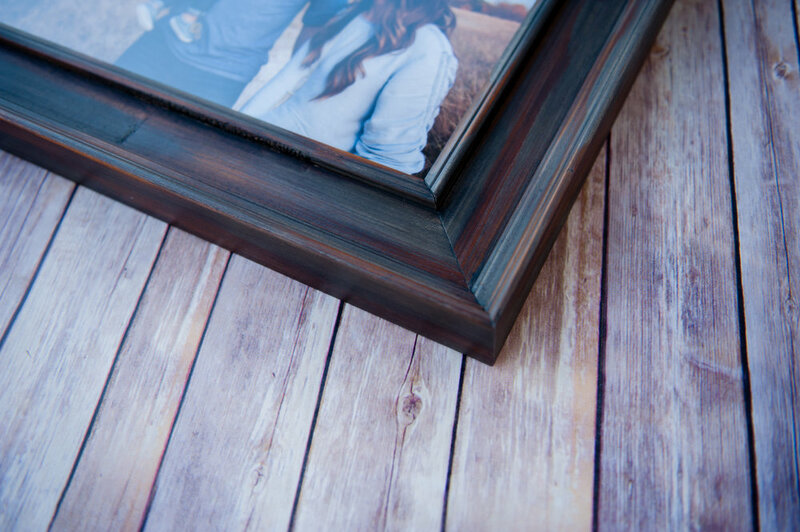 Each handmade, rustic frame is made from natural reclaimed cedar. Frame is ready to hang in portrait or landscape orientation. The rustic charm of this natural wood also means that no two are exactly alike! We also offer traditional, low-glare acrylic frames for our clients who prefer a more timeless look. Luster-coated prints mounted on Masonite are ready to be framed immediately without glass. We also recommend displaying your favorite mounted prints on a table easel in your home. Print sizes range from 8x10 to 30x40. Although we want all of our clients to purchase custom wall art and albums, we understand that many of our clients still want a backup of their favorite images on a USB drive. Digital files are available for purchase after your portrait session. We offer wall art installation at no extra charge to our clients. It is our goal that you're able to enjoy your wall art as soon as delivery day. We understand that some clients may intend to hang their wall art, but they're either nervous they'll do it wrong or they just never get around to doing it. Let us do the hard work for you so you can enjoy your products right away! Excellent customer service is our #1 priority. We are committed to your satisfaction from beginning to end. We are not interested in flooding our calendars with a million clients. We only accept a few clients each month so we can guarantee top-notch service to the few we choose to work with. Contact us today to see if we'd be a good fit for your needs.